Stop until the light changes to green. Back out of the intersection, if possible. Complete the turn when traffic clears. If you are already within an intersection when the light changes from green to yellow, do not stop. Proceed cautiously, completing the left turn when it is safe to do so. When making a left turn, you must always yield to oncoming traffic. Right turn on red light permitted with caution. All traffic must turn right at next intersection. Signs with a red circle and diagonal line over a black symbol indicate the the action represented by the symbol is prohibited. 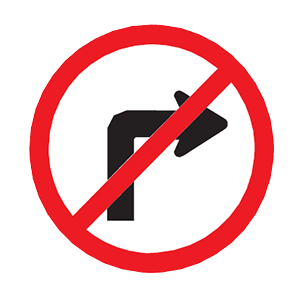 In this case, the sign indicates that right turns are prohibited. Small vehicle drivers cannot adequately see large trucks and buses in their rearview mirrors. Large trucks and buses, due to their size and weight, require longer distances to stop than smaller passenger vehicles. Large trucks and buses travel at a higher speeds than small vehicles. Large vehicles require longer distances to stop and accelerate than smaller vehicles do. Making a sudden stop in front of a large vehicle is dangerous because the other driver may not be able to stop in time to avoid a collision. Driving or attempting to drive while smoking. Driving or attempting to drive before midnight. Driving or attempting to drive after consuming alcohol. If you are not yet 21 years of age, it is not legal for you to be drinking at all. If you are pulled over and you have been drinking, your license will be suspended or revoked. In addition, you could be charged for violating the alcohol restriction on your license.